I’ll get back to my regular Undervalued Spotlight posts next week. This weekend I spent a lot of time thinking about and discussing a relatively new and exciting segment of the market so I thought I’d put some thoughts down into words and share them. It used to be CGC 9.9s were anomalies, random lottery winnings that brought the lucky submitter a nice influx of cash. I used to quickly rush any books that came back 9.9 to auctions wanting to cash in as quickly as possible, hopefully before the next CGC 9.9 made it onto the CGC Census. Today I’m seeing the beginnings of what I predict will be a thriving CGC 9.9 marketplace. It’s all about supply as in you need a certain amount before an actual market in the stuff can exist. A supply will lead to transactions and in turn these transaction results will rise or fall and be influenced by many of the same market factors that affect all other grades with an obvious extra weight being put on Scarcity of Grade. Which books emerge as the foundation to this new market will be dependent on a numbers game, I’ve come up with a rough vision of this initial market that can obviously be totally wrong but it makes sense to me so I’ll present it. CGC 9.9s are where the big boys will want to play, collectors and investors at the highest levels always target the best of the best so this will be their domain. Batman #1 (Golden Age) has 1 CGC 9.2, 2 CGC 9.0s, 3 CGC 8.5s and 5 CGC 8.0s. Tales of Suspense #39 (Silver Age) has 1 CGC 9.8, 4 CGC 9.6s and 20 CGC 9.4s. Incredible Hulk #181 (Bronze Age) has 1 CGC 9.9, 114 CGC 9.8s and 272 9.6s. Now to me these numbers make sense, the Golden Age top grade doesn’t have that many books below it because the 2nd best and 3rd best grades are scarce too. With the Silver Age we see things open up a bit below the top grade so while the CGC 9.8 Tales of Suspense #39 may be off the market the 24 9.6/9.4s act as the top of the market. A market with only 24 copies floating around is a tight market and prices realized for CGC 9.4 Tales of Suspense #39s are impressive. Jumping over to the Bronze Age we see things open up even more. Yes the lone CGC 9.9 Hulk #181 is off the market (as is the lone PGX 9.9) which leaves the 114 CGC 9.8s the absolute top of the market for Hulk #181. So for the big boys a CGC 9.8 White Page Hulk #181 is the best possible book they can own and demand still outstrips supply by a massive margin. This above pattern/model basically falls apart once we his the Copper Age/Modern Age. 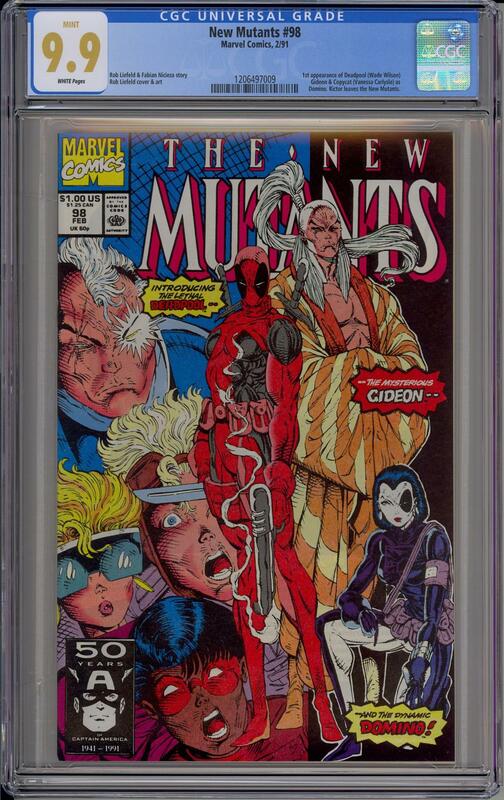 New Mutants #98, there is 1 at CGC 10.0, 11 at CGC 9.9, 2,556 at CGC 9.8. 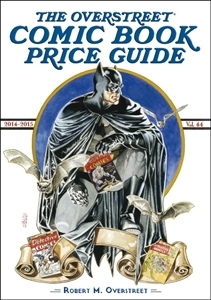 For this book the current high end market is CGC 9.9, there are simply too many CGC 9.8s to make them an effective high end item meaning supply is controlling the price to below $1,000 – heck even I can afford one. So for deep pocketed fans of Deadpool and for high end investors in the comic market CGC 9.9 is the new high end standard for this book and that is something we could not have said a decade ago. Worried about CGC 9.9s eventually not being scarce? Take heart, as of this post there have been 12,329 CGC Blue Labels graded meaning for every 1,120 books sent down 1 gets a CGC 9.9. There would have to be 25,000 graded copies out there for the CGC Census to reach 24 for New Mutants #98 at this rate. Why did I pick 24 ? So I can compare New Mutants #98 to Tales of Suspense #39. Quick, which is the bigger character/worldwide phenomenon? Deadpool or Iron Man? The answer might depend on the age of the person you ask but the point is that both characters are huge global franchises. So why does one of the 24 best copies of the 1st Iron Man get over $100,000 while one of the 11 best copies of Deadpool get only $11,000? That was a question I asked a friend of mine when I was explaining all this back last fall. I think I explained a little too hard because he went out and bought a CGC 9.9 New Mutants #98 for $11,000 and change. He was one happy camper when that recent copy went for $23,000 plus. Still, why the huge gulf in price? The characters might have the same level of popularity, Deadpool is twice as scarce yet only gets a fifth of the market price? Is it because New Mutant #98s are so plentiful? I think that is why but in the end it shouldn’t matter because for the very top of the market Scarcity of Grade should be the ultimate barometer. Does the CGC 3.5 price for Tales of Suspense #39 affect the market for the CGC 9.4s? Does the CGC 8.5 price for New Mutant #98 affect the market for the CGC 9.8s? Maybe this is something the market needs time to grasp? Anyway, back to the budding new CGC 9.9 market. Currently there are 10 CGC 9.9 copies of Amazing Spider-Man #300, enough I hope to start seeing some consistent sales. Imagine a collector hunting down all the Spider-Man Black Costume/Early Venom books in CGC 9.9. I bet there are a few on it as we speak. Amazing Spider-Man #252, 258, 298, 299, 300, 315, 316, 317, Spectacular #90, Team-Up #141, Web of #18, Secret Wars #8… talk about an untouchable registry set!! So how is this market going to develop? Spawn #1 may be a good barometer – there have been a lot of CGC 9.9s (65 of them which is a lot relatively speaking) for a while and they trade heavily – the pattern is that the prices have been trending up and have doubled over the past 2 years and I think it could do even better as more Copper Age/Modern Age key issues join the “I wanna own 9.9s” party, issues like X-Men #266, etc. Anybody out there starting up a 9.9 collection? Anybody selling them as soon as they get them? The Iron Man is worth more than the Deadpool because there are many more 9.9s and 9.8s out there that haven’t been graded yet. 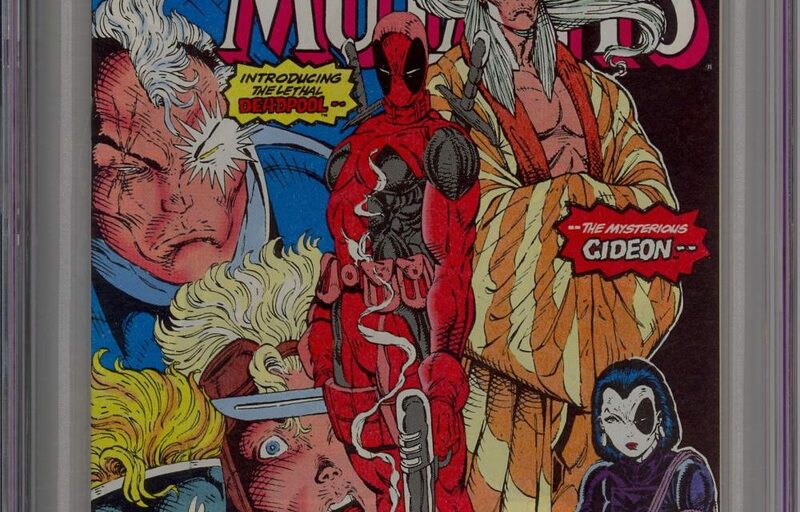 Most people knew who Liefeld was by the time NM 98 came out so there were already a bunch of speculators buying multiple issues, bagging and boarding them, and putting them away for safe keeping. Some of those issues have been graded but many haven’t so there’s more potential for finding additional high grade NM 98s than thereis for finding a lot more 9.9 TOS 39. Even though thee are ungraded TOS 39 issues out there, since they are so old, the odds that there are more 9.9 issues out there are extremely low. I’ve tried to factor in the extra ungraded New Mutant #98s. According to the 9.9 to 9.8 ratios for that book there would have to be 13,000 plus new submissions before the 9.9 population matches the population of 9.4s and 9.6s of TOS #39. I was comparing scarcity of grade for both books and trying to compare the market reaction to the top 24 copies if each of these books – the TOS #39 does not have to be a 9.9, for the TOS a 9.4 is the comparable, at CGC 9.4 they are twice as plentiful as the 9.9 New Mutant #98s but still get 5 times as much on the market. I hate to miss a Spotlight but this is a very interesting topic/thesis. I buy the statistics but the whole idea of this turns me off. As the standard advice to comic collectors/investors is first and foremost to dig the book that you are paying for, while this branch might develop as Walt suggests, I am mostly uninterested. – CBCS doesn’t have the same brand recognition. Sure, fine, but you could simply take the book and send it to CGC, so if the grade is fixed, why care? — CBCS is an easier grader than CGC. This probably waxes and wanes, but especially with CBCS owned by Beckett, there is reason to believe that management understands that relaxed standards will just destroy their brand, which continues to struggle to gain traction. A number of dealers have said or written (honestly or perhaps not) that they see no real difference. Also, for “normal” books (not 9.9s), CBCS is discounted more or less – when I estimate prices I discount about half a CGC grade for CBCS books, but I find that conservative – they will generally price in between. So I don’t think that’s the real reason that people are afraid the book won’t come back as a 9.9 from CGC. — The more likely explanation is: if you sent a _CGC_ 9.9 to CGC, it probably wouldn’t come back as a 9.9. (Aside: I’ve wondered if CGC puts secret invisible ink marks or something on the books they grade, so they have some control over being tested by “blind” resubmissions. Of course if this were the case and discovered, that would really be a brand problem.) So if what is valued is a 9.9 on a CGC case, you aren’t going to be able to get that by buying a CBCS 9.9 and submitting to CGC. – As a collector, I am interested in “true specialness”, and manufactured scarcity is not “true”. This is why I’m not interested in the variant cover area, or “limited editions” in general. These are specifically designed “collector’s items” and in my mind (and I’m sure the minds of many others), the meaning has to precede the rarity. If there is no true meaning to the 9.9 cases (because the books within are indistinguishable from the 9.8s, and maybe even from the 9.6s), why would I collect them simply because they are rare? Yesterday’s toenail clippings are unique and thus rarer than a NM #98 9.9, but I’m not hanging onto them. – As an investor, there is the lesson of the 1990s to consider. Collector’s items sold, so more collectors items were produced, with nearly all of these still available at or below original price. Of course my brand argument holds – I would not expect CGC to start cranking out a lot more 9.9s – but it is a possibility. That would devalue the existing 9.9s. On the other hand, let’s say somebody had a 9.8 CBCS Mile High (presumably a savvy, smart, virile collector), and CBCS suddenly started giving out 9.9s right and left. This would have virtually no impact on the value of this book, because the value is in the book, not in the case. I think this consideration should always be in the front of one’s mind when paying up for a third-party graded book. This explains why I’m not interested, but this does not mean that I am saying that your idea of a 9.9 collecting strain is not happening. I am rather arguing that I think there will be many collectors like me, who reject this collecting of managed scarcity as uninteresting and with a specific downside risk, and that will probably slow the appreciation of books in this strain. One more point: you ask, “Does the CGC 3.5 price for Tales of Suspense #39 affect the market for the CGC 9.4s? 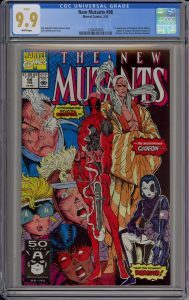 Does the CGC 8.5 price for New Mutant #98 affect the market for the CGC 9.8s?” The answer is: absolutely. The one caveat is that the CGC population for 8.5 NM #98s is not representative of the ungraded population (while it is for ToS #39). Guessing at the total population in each grade for each issue, I think you can see a very strong relationship across grades. In general I observe that on a relative basis the high grades are heavily discounted relative to the lower grades. And if you really believe that high grades can take off without the same happening in lower grades, there are ways to play this without getting into the 9.9 lottery. But don’t hold your breath – last year I thought Showcase #22 in 9.2 should sell for $150k, but it sold for $60k. Not only are you subject to the lottery, but you are subject to the rarefied set of collectors/investors at this level. As Charlie Kim pointed out awhile back, once you get over about $2k, you are losing a large chunk of the market, and you are sensitive to arbitrary factors (a key collector is on his boat when the auction ends, etc.). More reason to pass on this. Focusing on one aspect of Chris Meli’s lengthy post… The difference between a CGC 9.9 and a 9.8 is only what CGC says it is. There are no absolute rules or standards for grading companies. While most of us trust that they are subjectively doing their best, and they are certainly following general guidelines on grading, this process is based in part on the experience and opinions of the people who happen to be grading a particular book. And at the highest grades, it is VERY objective. There are 9.8’s that certainly appear “perfect” in every way. I think we have all have seen plenty. Therefore, if some 9.8 books appear no different from a 9.9 or 10.0, then those highest grades are in fact arbitrary to most/all of us. All that aside, the high prices are going to happen whether some of us agree or not. When CGC prints the 9.9 label, then it becomes fact in the eyes of the majority for as long as that case is not cracked open. This is the nature of the human beast… Some people want to say they have the “best” or “most expensive” of a thing for a lot of reasons, whether that “best” is an opinion or not. Other people simply want to buy something that is likely to increase in value and be resold. I get that. Investments are investments. I guess my whole point is let’s be very careful about VALIDATING that “9.9” or “10.0” is a concept that we should all accept… It isn’t a visible feature of a comic book. It is a bit ridiculous. If we are talking about a book itself, then a “9.9” is equal to “a really nice 9.8”. And if you are really buying a book, if you want one that is as close to Mint as any of us would have cared about 15-20 years ago, then buy a really nice 9.6 or 9.8 or a flawless raw copy and be happy. You’ll still satisfy your collecting and investing goal. I say be careful about how crazy you get beyond that. As Eric mentioned, there will be a segment of the market that buys into this. The bragging rights crowd and the speculators that want to feed to the bragging rights crowd can create quite an active marketplace. To one of Chris’ points – collecting the things you like and believe in is obvious good advice but it doesn’t work if you are looking for investment opportunities, leave personal likes at the door if you are speculating. This is related in a way – way back I was one of those old school guys that hated incomplete books, I thought nothing of them. It wasn’t that long ago that I noticed other dealers coming to my table snatching up my $50 or $75 coupon cut out Hulk #181’s. I balked at the first couple who told me they were getting $200 a piece for them. These coupon-less Hulk #181’s can go for $600 plus these days. My disdain clouded my view of a developing market and it cost me. You can’t compare a New Mutants #98 to a TOS #39 without adding in one other very important factor: total availability/scarcity. CGC census says there are 1998 graded copies of TOS #39. Meanwhile, there are currently 15157 copies of NM #98. To get to your magic number of 24, you must add 25k more copies – that is over 40k graded copies of that book. Clearly, TOS 39 is much, MUCH harder to find in ANY grade, let alone the cream of the crop. Great point Quentin. I noticed that also but failed to do the math or mention it. This is another great example of keeping these slabbed grades in perspective. Clearly TOS #39 is truly a rare book in high grade. A Modern era book, particularly a popular title by a major publisher, that is deemed 9.9 by a grading company is a rare label (artificial scarcity), but not actually a rare book. Oops, I swapped “objective” and “subjective” in my post above. Silly mistake there. Quintin, I can compare New Mutants #98 and TOS #39 – that is my point – that I can. I remember in the late 80s and early 90s when the Silver Age books were making a run I swear that back then if you told somebody that an Amazing Fantasy #15 would 1 day be worth almost as much as an Action Comics #1 you’d get laughed out of the con! The Action is a wat scarcer book, impossible to find, AF #15s are everywhere! The 3rd best CGC graded copy of Action Comics #1 recently sold for $2 million. What would 1 of the 4 best AF #15s (the CGC 9.6s) get on market now? A $1.5 Million? Scarcity here is about the same, top 4 versus top 3. This big money doesn’t care that there are 1,000 more graded CGCs of AF #15 it only cares about the scarcity at the very top grades. Walt, on your last comment I have to come back to my key point – artificial versus manufactured scarcity. Sure a “best” copy of AF #15 (4 in 9.6) is going to go toe-to-toe with a “best” Action #1 (2 in 9.0). In each of these cases, even to the mildly trained eye, it should be fairly easy to see that these are in reality “best” copies. In contrast: there is a SINGLE Incredible Hulk 9.9 – by your reasoning that should be worth more than either the highest AF #15 or the highest Action #1 (based on a rough read of character popularity). Really? I doubt it. There are 115 IH #181 9.8s, and one just sold for around $30k. Is somebody really going to pay $5 million for a 9.9 label on a case for a book that is indistinguishable from one of the 9.8s that can be had for $30k? I agree with your novelty/bragging rights argument to a degree, but the key point is that the bragging right is for the case (that CGC can manufacture more of at any time), not the book. So I disagree that “the big money … only cares about the scarcity at the very top grades.” As the grades become artificial and debatable (9.8 and certainly 9.9), the value of the grade drops precipitously. Whoops typos should read “SINGLE Incredible Hulk #181 9.9”. I shouldn’t be emulating Walt and posting in the middle of the night.